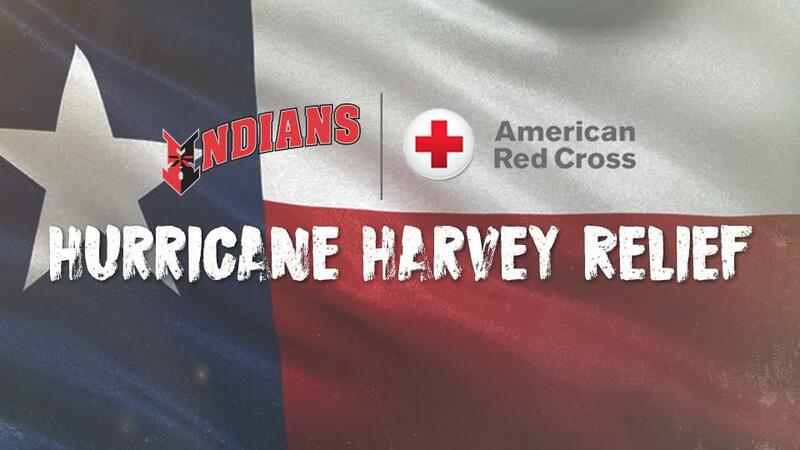 INDIANAPOLIS - The Indianapolis Indians are offering fans a way to help with hurricane relief efforts already underway. In collaboration with the American Red Cross, the Indians will donate a $1 for every ticket sold to their playoff games at Victory Field. The first game in Indianapolis is Friday, September 8 at 7:15 p.m.
"As we know, Hurricane Harvey devastated the Houston metropolitan area and parts of southeast Texas over the last week and a half," said Randy Lewandowski, Indians president and general manager. "Now, meteorologists are predicting a potentially similar impact in Florida with Hurricane Irma. We have this platform for the next several days, potentially hosting games at Victory Field from this Friday through Wednesday, September 13. We want to use this time to help those in need and provide a direct outlet for our fans to help, as well." Each playoff game the Indians host at Victory Field will be considered for the donation. The Tribe could host as many as five home playoff games, depending on how the action on the field unfolds. The Indians play their first postseason game at home on Friday, September 8, which is Game 3 in their first round best-of-five series versus the Durham Bulls. First pitch is scheduled for 7:15 p.m., with the first 1,000 fans getting an Indians playoffs t-shirt. Fans are encouraged to stick around after the game for the season's last on-field Friday Fireworks display. If necessary, the Indians also host Games 4 and 5 on Saturday, September 9 at 7:05 p.m. and Sunday, September 10 at 1:35 p.m. If the Tribe advance past Durham, they host Games 1 and 2 of the Governors' Cup championship series on Tuesday, September 12 and Wednesday, September 13. Both games are scheduled to start at 7:05 p.m.
All playoff games will be Dollar Menu days at Victory Field concession stands, with hot dogs, peanuts, Cape Cod Potato Chips, Cracker Jack and popcorn available for just $1 each. Ticket requests for Knot Hole Kids Club members and flex ticket vouchers will be accepted for each game and will count towards the American Red Cross hurricane relief donation. For tickets, visit IndyIndians.com or the Victory Field Box Office.